Potatoes! 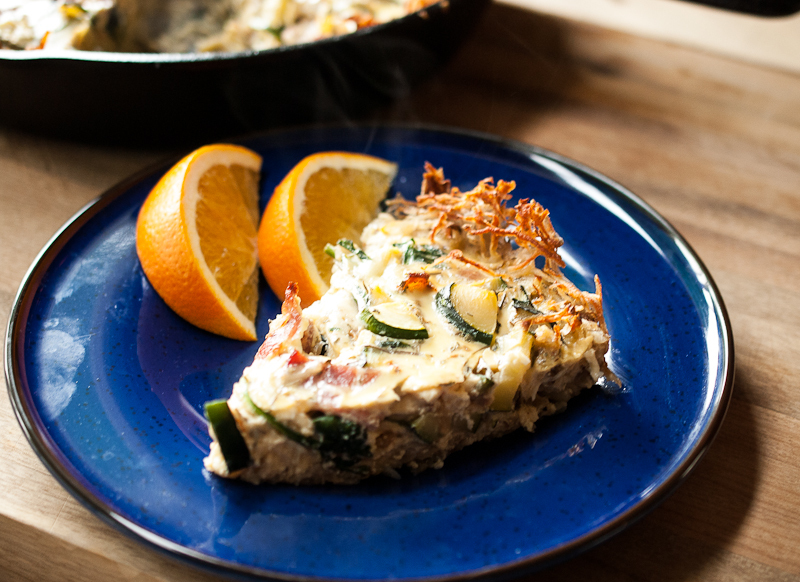 Yes, potatoes, they make a great crust for this quiche! 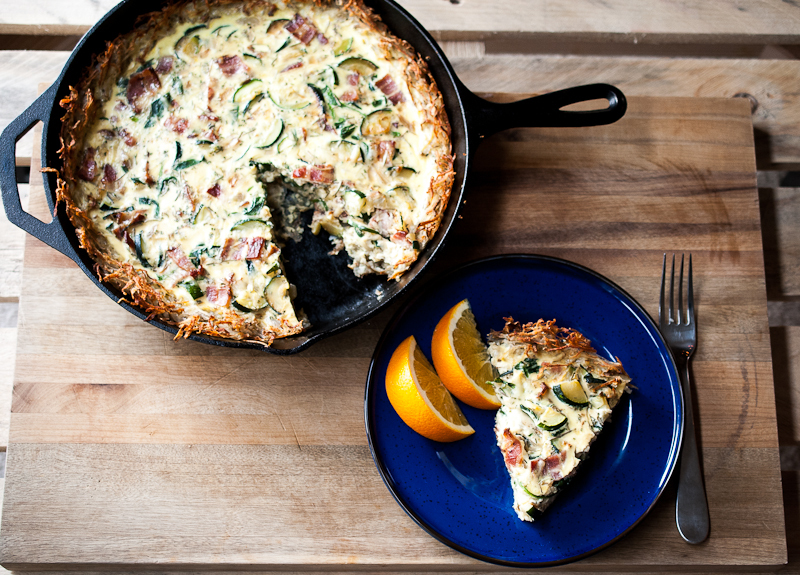 You could make a gluten free pie crust for your quiche, but that’s not as fun as a hash brown quiche! You need a 10 inch skillet, Lodge is my favorite, and lots of patience to peel the potatoes or……you could use a slicer attachment for your stand mixer, that’s what I did. Potatoes to hash browns in less than 10 minutes! 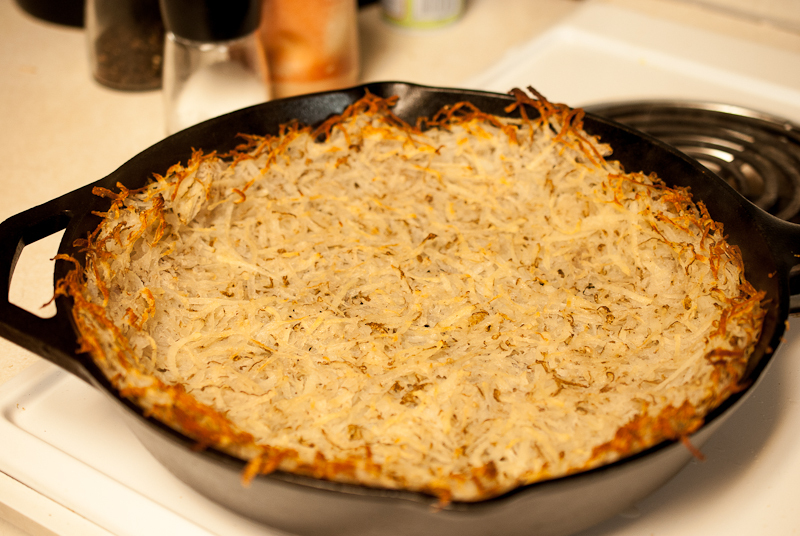 Now this looks like a TON of hash browns, but it does cook down by almost 50%… I used 5 medium potatoes and layered it on thick in the skillet. You must dry these really well, or you will end up with a soggy crust. I hear a salad spinner works great, but I do not have one, those crazy spinners are about 40 bucks! A lot for a specialty, only use once in a blue moon, kind of gadget. (Yes, I buy the pre bagged salad, shhh, don’t tell anyone! ) The easiest way I found to dry them out, is after rinsing the sliced potatoes, aka has browns, lay them them on a single layer on paper towels, and blot to dry. Seriously….these spuds hold a ton of water! 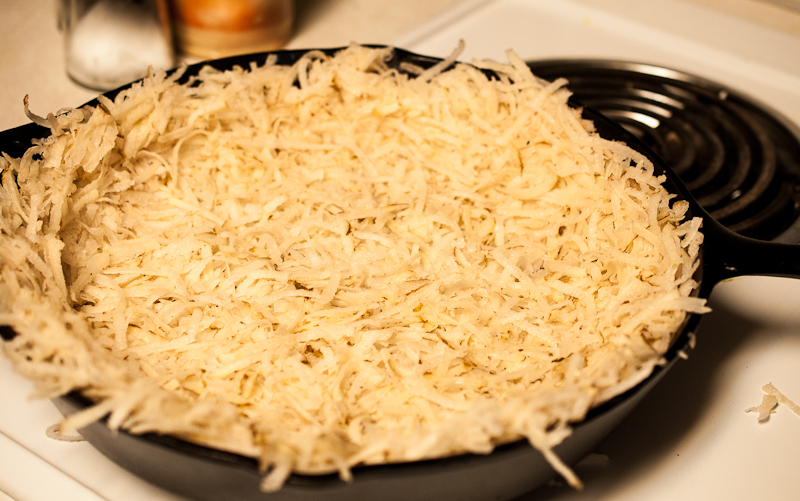 After baking in the oven for 35 minutes, the hash brown crust has cooked down a lot from the above picture. A nice golden brown, no soggy bottom here :) I really recommend the Lodge skillets, they are awesome to cook with. 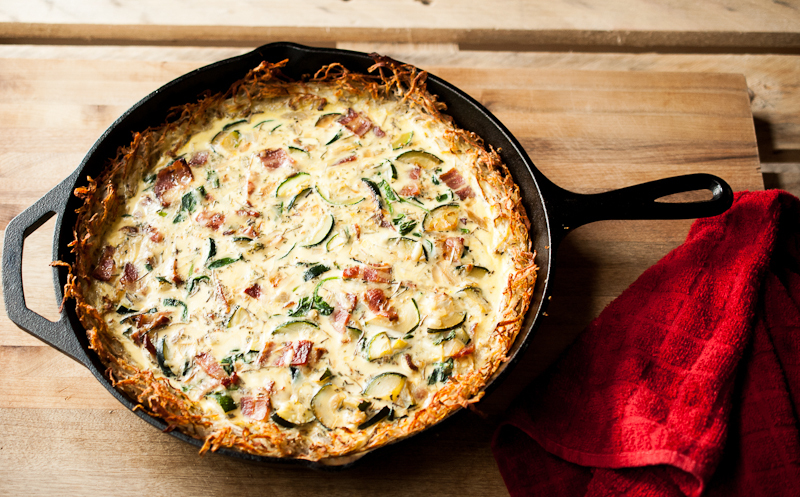 From oven to stove to table…a really great skillet, I’m not sure how I got a long without it before! Piping hot from the oven, a great breakfast for the chilly winter weekends. I like to add zucchini and bacon in mine, sausage also works great too. In the summer you could use mushrooms, spinach, and gruyere cheese for a lighter quiche. Grate potatoes to has brown size using an attachment for your stand mixer or with a peeler. Rinse thoroughly till water runs clear. Dry has browns using paper towels or a salad spinner. They need to be very dry! Toss has browns in melted butter, a little olive oil, salt and pepper. Arrange in cast iron skillet, pressing up the sides. Yes, use all the potatoes, it looks like it’s too full, but cooks down by half! Bake in oven at 425 degrees for 35 minutes, until crispy. In a different skillet, cook bacon, drain fat, and chop into small pieces. Sautee onion and zucchini until soft. In a large mixing bowl, whisk eggs and milk together. Add bacon, onion, zucchini, herbs and cheese. Mix by hand until just combined. Pour mixture into hot has brown crust. Bake at 375 degrees for 30 minutes or until set. Love this idea! 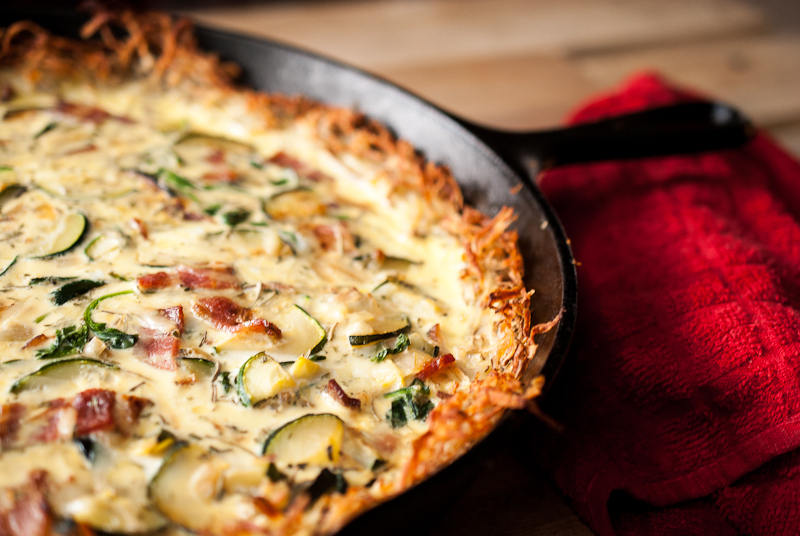 The hash brown crust sounds totally fantastic…what a great idea for a gluten free crust! :) So yummy. If there is an IKEA near you, get a salad spinner there. I believe it’s about $3 and works very well!! Thanks for the tip Allie! I do have an Ikea in Portland, I will check it out for sure! Love quiche! Thanks for sharing this with us! Cheers! Glad you like it thanks for stopping by!! The Hashbrown Crust pushes this into the Man Food Category. Let’s not call it Quiche… Let’s call it: Thor Pie!